Y’all. Can we talk about wool crepe for a minute? I just love this stuff to tiny threadbare pieces and I wish everything I made had a wool crepe option. I love the spongy texture, the glorious drape, the magical body-temperature-regularity (yay, wool! ), and the COLORS. Truly, everyone should have at least one experience rolling around in a uncut length of wool crepe. 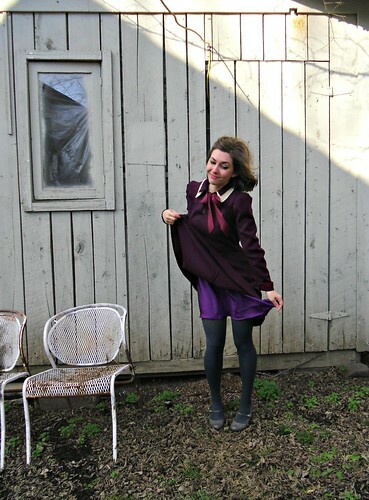 Especially if it is a jewel-toned wool crepe. Ooh la la. For my first Mood Sewing Network project, I wanted that experience to include wool crepe. I have a beautiful 1940s Simplicity pattern that I knew would look amazing done up in such a fabric. And since we’re talking about ~my first time~, I decided to go all out with my bad self and splurge on silk crepe de chine lining and satin bias tape as well. The end result is very… purple. 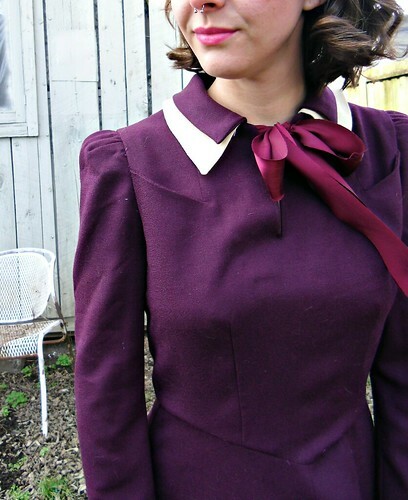 The pattern I used is Simplicity 3178, which is undated but looks to be from the late 30s/early 40s. 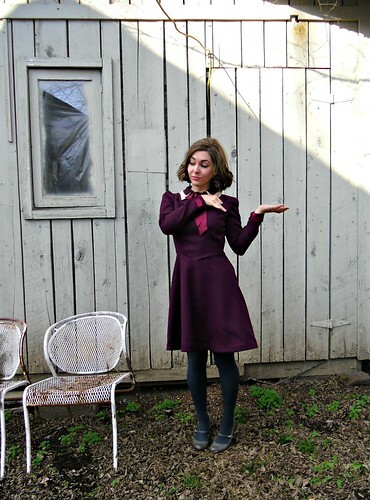 I love vintage patterns because they always have sweet little details, like the darts on the elbows that provide gentle shaping for the sleeves and the shoulder yokes that are actually pockets (!!). 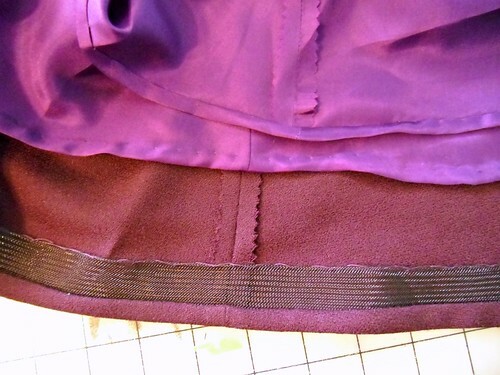 The skirt is bias cut, so I finished the hem with 1″ horsehair braid to give it a nice flare. 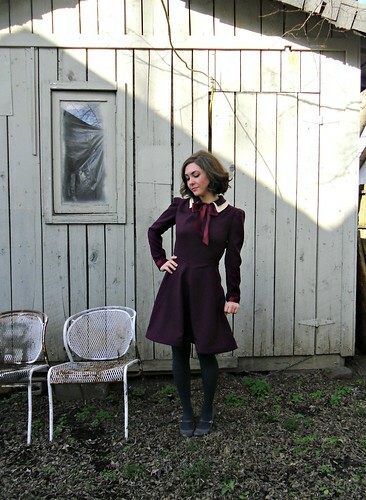 The pattern gives a couple of options for finishing the neckline – I went with the double collar (self fabric on top and ivory wool crepe at the bottom) and a giant bow! I didn’t have to make too many changes to the pattern to get a good fit. 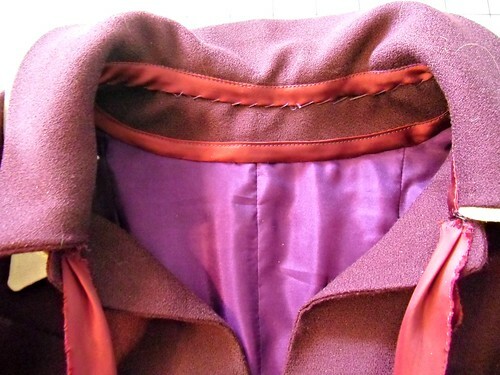 I took in the side seams by 1/2″, tapering up to the underarm. 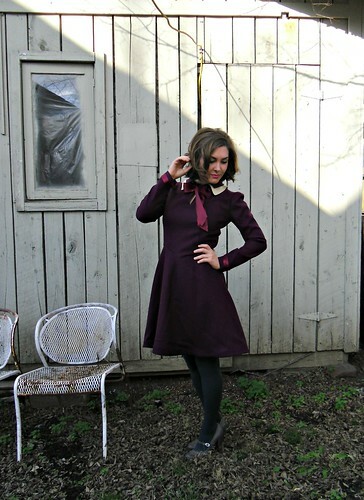 I also removed a whopping 9″ of length from the skirt – the original pattern pieces came all the way down to my ankles! Yeech! I reckon the pockets are totally unnecessary, but ughhh I love those little guys! This baby is also lined! Wool crepe really begs for a nice lining to give it some additional structure, and although the pattern doesn’t include pieces or instructions for adding a lining, it wasn’t too difficult to figure out. Unfortunately, I didn’t correctly calculate my yardages, so I didn’t have enough lining for the entire dress – which means the sleeves are not lined. I’ve noticed a distinct lack of lining in lots of dress sleeves, so this doesn’t bug me too much. 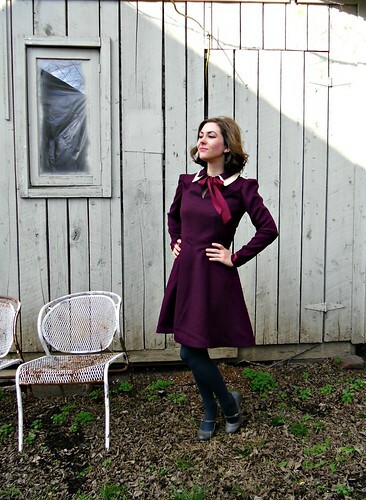 Bonus plus: now you can see the pretty bias tape at the sleeve hems! Also: lol at this hideously unflattering photo of me. IT WAS WINDY WHEN I TOOK THESE PICTURES, OK. The instructions do call for the sleeve slit and hems to be finished with bias tape, and then closed with a series of snaps. After trying the dress on during one of many fittings, I decided to flip the hems back to show the bias tape since the dress really needed a bit of color breakup. I pressed the cuff (wool crepe really does press so beautifully) and tacked down each side with a couple of hand stitches to keep everything in place. 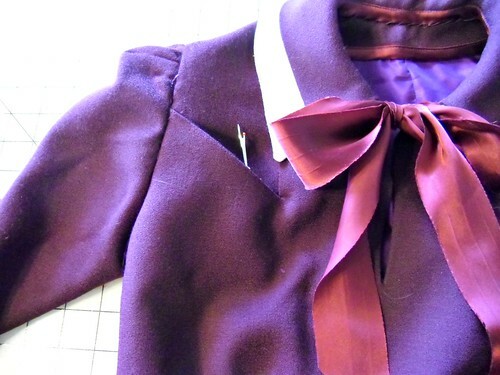 The neck bow is the same bias tape, just pressed completely open. I think the shoulders are my favorite part of the dress! Instead of using shoulder pads, I made a small stiff rectangle with horsehair interfacing and tacked that to the armholes like a sleeve head. 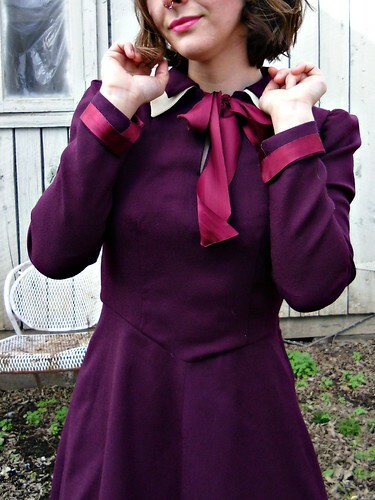 It keeps the pleats from dropping too much and gives the dress those badass strong shoulders that were so fashionable in the 40s. I worked hard to make the inside of this dress just as pretty as the outside. The yoke pockets and neck facings are lightly interfaced with silk organza, the facings are finished with satin bias tape, and I even rolled the hem lining and used tiny hand stitches to secure it. The collar is detachable – its current state of attachment involves basting stitches. 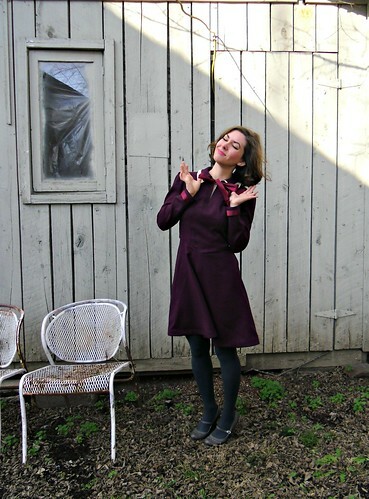 Overall, I’m very happy with my dress – I love it’s snuggly wool warmth and did I mention purple? Because purple.